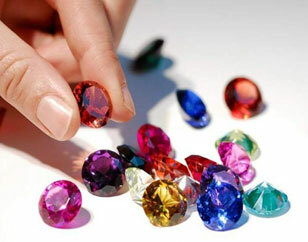 In astrology, there are mainly nine gemstones. Sometimes, these gemstones are very costly. They might be duplicate. In this case, we can wear substitute of gemstones. They are cheap as well as effective. Gemstone gives effect for long time. However substitute of gemstone gives effect for short time. There is one gemstone and many substitutes for one planet. One gets definite results through substitute. Sun: Ruby is main gemstone of Sun. Tamadi, Laldi, Lal Turmali and Garnet is the substitute of Ruby. However, Spinel is very effective gemstone. Wear it in ring finger. Moon: Pearl is main gemstone of Moon. Moon stone and Agate are the substitute of Pearl. It is effective to wear moon stone in silver. Mars: Coral is main gemstone of Mars. Red Agate is the substitute of Coral. Wear it in copper ring. Mercury: Emerald is main gemstone of Mercury. Green Bairuj, Onex, Margaj etc. are substitute of Emerald. However, Margaj is very effective. It is beneficial to wear in silver. Jupiter: Topaz is main gemstone of Jupiter. Yellow Bairuj, Sunhala, Velo Sitrin etc. are substitute of Topaz. Yellow Bairuj is very effective. It is beneficial to wear in brass or gold. Venus: Diamond is main gemstone of Venus. Jerkan, American Diamond and Opal are substitute of Diamond. However, Opal is very effective. Sometimes, Opal works better than diamond. Wear it in silver. Shani: Sapphire is main gemstone of Shani. Neeli, Blue Topaz, Lajwart, Sodalight are substitute of Sapphire. However, Sanjnight is very effective. It is beneficial to wear in silver. Good Luck: Chant Gajendra moksh on Thursday. It strengthens the Jupiter as well as it is beneficial to get rid of problems.